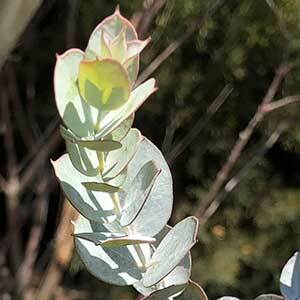 An attractive small tree, Eucalyptus albida is commonly called the White-Leaved Mallee. It is the colour of the new leaves that give it the common name, they are a smokey greenish white and rounded. The mature leaves are a deeper green and lanceolate in shape. Reaching around 3 metres in height, creamy white flowers appear in summer and attract bees and birds to the garden. The new foliage is widely used in floral arrangements and this is a species that can be coppiced to promote the attractive new growth. Best grown in a sunny position and in a well drained soil. Once established Eucalyptus albida requires very little extra care other than pruning if desired. Spread To 2 – 3 metres. Foliage – Juvenile foliage is a grey to white, mature foliage is green.